Typically there are two types of maintenance undertaken by companies like Hydrosphere: Casualty Response and Planned Maintenance. The first is something most harbour masters would like to avoid – an urgent and expensive response to a navigation aid failing for one reason or another. When budgets are tight it can be difficult to earmark spending for maintenance. We’re seeing some authorities and harbours pushing back their maintenance schedules from yearly inspections to 2 years or more, both for land and offshore aids to navigation. Many smaller harbours and ports have no planned maintenance schedule at all, which means call outs are always an expensive casualty response. 1. Casualty response costs ££££s: If you have recently had damage to a buoy or a failed light you will know how expensive an urgent repair or replacement costs. Boat time, man-hours, and parts add up, and costs can soon exceed a yearly maintenance contract. 2. Pre-empt casualties: Planned maintenance can spot problems before they develop, such as unreported damage, reducing your casualty rate. 3. Increased lifespan: Regular maintenance can greatly increase the lifespan of your aid to navigation, power supply and ancillary equipment, even with long-lasting applications. Saving money on replacements in the long-term. 4. Monitoring: Regular maintenance can also include automatic monitoring. Remote monitoring units report back using the GSM network or satellite and can provide essential information such as the location of a buoy, battery power and whether a light is working correctly. In many cases this can pre-empt casualties and allow planned maintenance instead. Another thing to consider when thinking about the cost of maintenance and repairs is whether your navigation aids are costing you more than they should. Yes, your steel buoys may be over 100 years old and still going strong, but maintaining these legacy aids does not come cheap. Compare the costs of maintaining a steel buoy compared to a modern polyethylene equivalent. 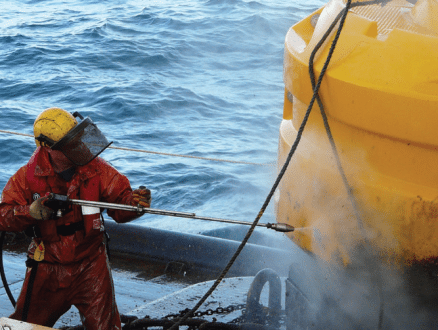 Instead of bringing them in every few years for repainting and refurbishing as you do a steel buoy, plastic buoys can be cleaned and repaired at sea – they don’t rust and no painting is involved. Long-term replacing your legacy navigation aids with new technology could be a very cost effective solution, reducing your maintenance and repair costs considerably. As we explored in our recent blog post on navigation lights, replacing like-for-like is not always the best solution. Advances in technology mean that there are many new products and options available that deliver long-term savings, especially in respect to maintenance and repairs.